Lately I’ve been doing a lot of soul- searching about yoga. Not because of the recent hullabaloo over the sexual peccadilloes of a certain yoga mogul or the continuing controversy over whether yoga will maim us (as put forth by media coverage of William Broad’s book The Science of Yoga). No, my crisis of faith has to do with a real falsehood being perpetuated in the yoga world, one that truly calls its integrity into question. You see, while I was once fond of pronouncing to new students that yoga is NOT gymnastics, but an ancient practice uniting mind, body and spirit, I can do so no longer. I’ve discovered that the alphabet of postures I’ve spent years learning -and so diligently teaching – have almost nothing to do with any yogic tradition. According to Mark Singleton’s book Yoga Body: The Origins of Postural Practise the lexicon of asanas I hold as sacrosanct have a decidedly more secular origin – gymnastics routines of the early 20th century! Singleton not only flayed my sacred cow, he left me in need of a new opening gambit. And he left me questioning – why despite the mounds of historical evidence to the contrary, do we (the yoga community) persist in teaching postural practice as part of a venerable and ancient tradition? Singleton is just one of many scholars whose research reveals that the great guru Krishnamacharya (1888-1989) not only laid the footwork for modern yoga, he revamped its reputation for mysticism with a modern emphasis on health and physical fitness. Considered the godfather of the global asana boom, he merged Hatha-yoga traditions with gymnastics, calisthenics and body building regimes to bring us the most popular yoga styles of today, notably Iyengar and Ashtanga Yoga. But Singleton is clear -any claims linking this “dynamic system of asana” with yoga tradition are “simply untenable from a historical point of view”. Aside from a handful of sitting postures, “yoga” as described in The Vedas, The Upanishads or the Hatha Pradipika focuses almost exclusively on meditation and breathing techniques. A stark contrast to today’s typical yoga class which might begin and close with guided meditation or sandwich in a few mantras, but revolves around the physical practice of asana. Pretty heavy stuff for devoted yogini such as myself to contemplate. It called into question everything I held nearest and dearest about yoga. Were the yoga purists right? The ones who claim that yoga as practiced today in the west is just a fraud? If all my alliance certified emphasis on technique and alignment in posture was just gussied up gymnastics … what exactly was I teaching? What about my most cherished notion of occupying the body as sacred space, of asana as moving meditation, of union of body, mind, breath and spirit. Surely at least that much was authentic? The first documented asanas come to us from the century’s old school of Hatha-yoga (“Union through force”). While these sitting postures were also practiced for bodily strengthening and purification, their main purpose was to prepare the body for the real work of yoga; meditation and the realization of divine consciousness. So when did it change? How and when did we come to see physical posture not as preparation for anything -but as the main meal? Even as the way itself? And once again, Singleton traces the answer to gymnastics – albeit of a very different kind. Turns out our modern idea of asana can be directly traced to a group of women ‘harmonial’ gymnastics teachers whose “spiritualized” methods of movement and dance became firmly associated at the end of the nineteenth century with yoga. And according to Singleton, their”spiritual stretching, breathing and relaxation regimes ‘ are the direct precursors of the “New Age versions of postural yoga that have emerged in the West”. 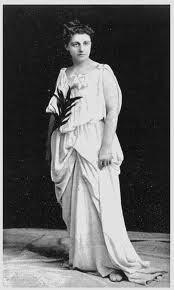 Genevieve Stebbins (1857-1915) whose book Dynamic Breathing and Harmonial Gymnastics: A Complete System of Psychical, Aesthetic and Physical Culture laid out a completely rounded system for the development of brain, body and soul”. Stebbins urged students to imagine “cosmic energy flowing into the hollow limbs of the body with the breath”…“in one grand surging influx of dynamic life”. Mollie Stack was the author of the 1931 book Building the Body Beautiful, and the founder of the most influential of women’s gymnastics organizations. She claimed her stretching and breathing routines were “designed to induce equilibrium between body mind and universe” thus” producing “a live giving, stimulating ecstasy upon the soul”. Singleton points out, that while these women were not doing yoga as we understand it, the motto of a popular woman’s physical health magazine of the 1930’s “‘Sacred thy Body, even as thy Soul” could just as easily sum up the editorial focus of Yoga Journal today. Stebbin’s and Stack’s books were decades ahead of B.K.S. 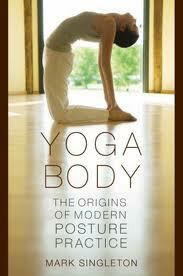 Iyengar whose book Light On Yoga, is generally credited with the view of the body as temple. Eric Shaw is also a scholar who has written extensively on women’s contributions to the history of yoga. He claims Stack invented yoga-flow long before K. Pattabhi Jois and makes the fascinating suggestion that one reason Iyengar yoga has come to dominate the practice of mainstream yoga (even governing standards of certification) is its gentler spiritual approach appealed more to women than the more athletic forms such as Ashtanga. Women today not only dominate yoga studios, many are evolving and participating in new forms of yoga that move us beyond the gymnastic derived syllabus. But whether they are embracing Shakti Flow, Trance dance Yoga or Sacred Movement, their ideas of spiritually embodied postural practice owe a debt to Harmonial gymnastics. So why had I never heard of Stebbins or Stack before? Could it be that these women simply don’t fit in with the aura of ancient history that the yoga world currently clothes itself in? Isn’t it time – if we are to create an honest discourse and a more meaningful history relevant to its practitioner’s today– that we acknowledge the contributions of women? That said, it seems to me that the yoga world’s reluctance to own up to historical facts isn’t based in misogyny or in wanting to ‘pull the wool’ over anyone’s eyes, but in fear of facing what we are left with if we do. But isn’t freedom from tradition also tremendously liberating? It encourages growth and evolution, keeping yoga vital and relevant to each new generation. And after all, it has allowed women to engage en mass in what was once an exclusively male practice. Singleton may have destroyed some of my deepest beliefs about yoga, but by forcing me to dispense with the veneer of antiquity and seek a deeper truth he freed me to discover something new. A paradigm shift in fact. I believe when future historians look back they will say yoga’s rising popularity and amazing growth was fueled by a need not addressed by fitness studios and aerobics classes. No longer satisfied with mere calisthenics routines, we flocked to yoga for something more, something we couldn’t quite put a finger on – but something that definitely felt right -our desire to experience the body and exercise as more than mere mechanics. That’s why I no longer need to be bound to sacred texts to justify seeing the body as sacred. I’ve come to understand that yoga is the vehicle by which the Cartesian view of the body as machine is being superseded by a new (old?) idea of the body divine. Well that has certainly been the case for me. So from now on this is what I will tell my new students. Yoga, the practice of asana, may have little to do with ancient texts, but it has everything to do with a new way of thinking and experiencing the body. So it doesn’t matter if asana is derived from gymnastics, or whether we change them or make up new ones. What matters is our intention – the meaning we assign to our actions. If we choose to see asana purpose as the union of body, mind and spirit, so it shall be. Yoga has continued to evolve to meet the needs of its practitioners and will continue to do so. Its goal is to move us towards our true self. I think the merging of ancient yoga text with ‘Harmonial Gymnastics’ is fantastic and doesn’t shake my ‘faith’ in my yoga practice at all. The western world, our world, is built on the culture of movement. Asanas, as they are interpreted today, move us towards the stillness we could not otherwise obtain. I have reflected on this question a lot and will be publishing a detailed take on it in my book that’s coming out in June. Essentially, I don’t think that yoga is either an ancient Indian practice or a wholly modern Western one, but rather a creative East-West synthesis that incorporates elements of both modernity and tradition. I agree with your point – and to take it further it seems to me that modern yoga is essentially a synthesis of eastern ideas/tradition and western physical practice. Aside from scant references in the Hatha Yoga Pradipika or the elusive, yet to be found Yoga Korunta, there is an underwhelming amount of historical evidence for yoga as a postural practice. What seems to be new/modern is that we’ve infused secular postures (exercise & calisthenics) with Eastern ideas of spiritual development to create the modern phenomenon known as yoga. The big and interesting question is why? As to that I’m sure your book will be an enlightening experience! I look forward to it. Actually, ‘modern hatha yoga’ as we know today DOES have its roots in the sacred texts. This because hatha yoga is really a practice of the tantric lineage. Doing stretches to sit in meditation isn’t what hatha yoga is about if you refer to the HY Pradipika and other texts- these are more ascetic practices of the likes of Patanjali.. The kundalini practice in traditional tantra is the key. But modern hatha yoga can also be traceable to other tantric texts like the vijnanabhairava tantra or yoga spandakarika. The tantrikas were truly revolutionary in that they did not claim a limited number of means to practice but rather an unlimited number, allowing for constant evolution of practice. The Shiva Sutras even prescribe different types of practices and one category specifically uses the body (see the 36 tattvas in the tantric map of cosmology). All our practices today are, in my view, very tantric because we do whatever makes us move in a direction of higher consciousness. We can therefore rest easy that we are safe! The true issue is what is yoga (hatha, Bhakti, jnana, kundalini etc) because we teach poses, mantras, pranayama, meditation in the name of this ‘yoking’ – question is what is this ‘yoking’? How do we describe it. It’s really only ONE yoking but many paths to achieve it, poses or otherwise. Of course hatha yoga (and the idea of the ‘body divine’) has roots in tantric lineages – – but the point of my post is that the standardized lexicon of postures (as taught in any mainstream class) are a 20th century phenomena. Shrouding these postures in the language of antiquity and mysticism (again as taught in most mainstream yoga classes) has become part of the sales pitch of commercialized fitness oriented yoga. I also believe it leads to an obsession with the idea of alignment, of doing yoga right, with mechanics – which leads us AWAY from the true purpose of yoga…. As a longtime pilates teacher, I greatly appreciate your wonderfully insightful post. Here’s to paradigm shifts…towards unity in body, mind, and spirit, all!